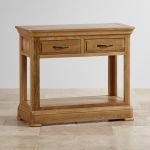 This striking hallway table boasts traditional design elements coupled with modern, bright solid oak for a high quality feature piece for your home. 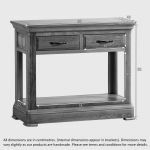 Ideal for the hallway or entryway, our Canterbury console table has two deep drawers for excellent hidden storage. 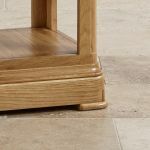 The bright natural wax finish of the table allows the wood grain to really stand out, and the warm tones of the wood add a work perfectly in contemporary homes. 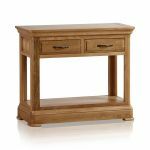 Added detail, inspired by classic furniture design elements include flared cornices, rounded corners, and dark antiqued metal hardware. 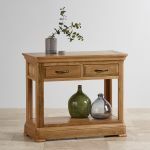 The deep pedestal base acts as a lower storage shelf, and the top has beautiful cut detailing. 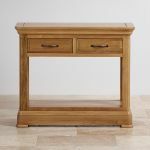 The drawers are made from only solid oak throughout, even the bases, backs, and runners. 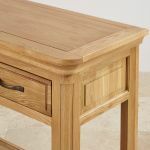 They are finished with stunning dovetail joints which add to the piece's strength and durability, so you know your new Canterbury hallway table will keep looking great for years to come.